Back at C2E2 I attended Insight Editions’ panel on the making of “Art and Making of” books. 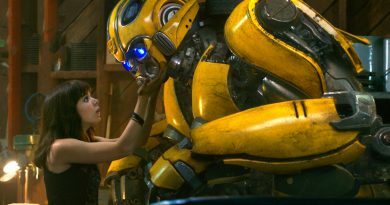 Towards the end they mentioned their desire to create more ways to pull fans into their favorite stories and inspire them to create. One of the ways the publisher does that already is through their IncrediBuilds™ series. 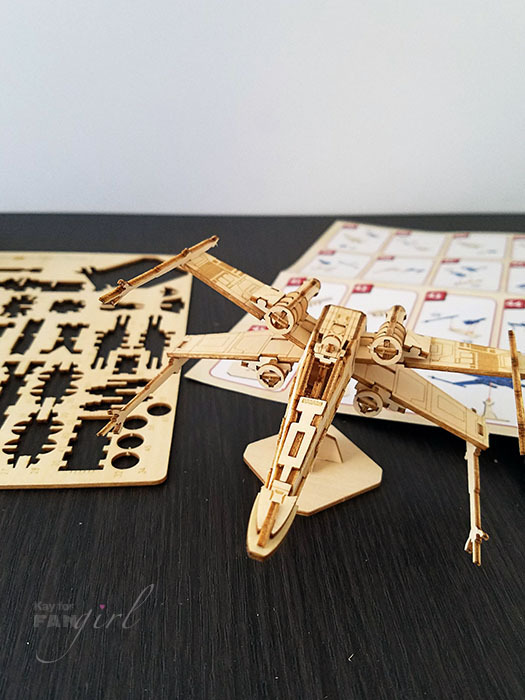 These 3D art kits allow you to build ships, props, droids, and other characters from movies, TV, books, video games, and comic books out of eco-friendly, FSC®-certified wood and then customize them however you like. 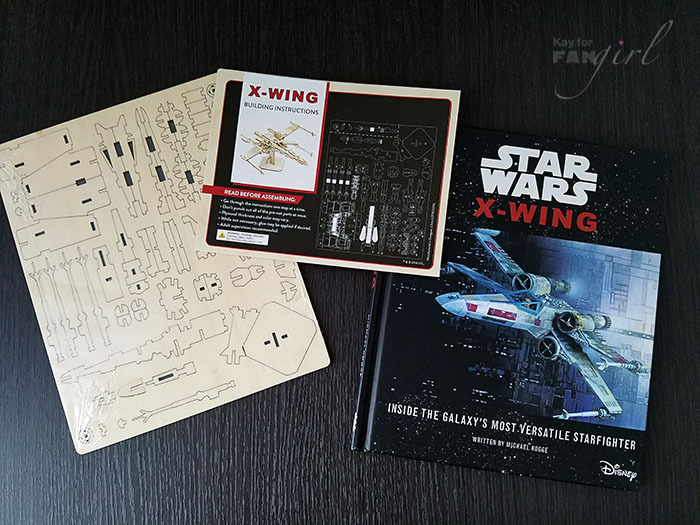 I’ve never built any models before so I was thrilled when Insight Editions sent a deluxe book and model set my way to build one of Star Wars’ X-wings. I thought the X-wing starfighter looked cool from the first time I saw them on screen and I’ve wanted one of my own ever since one of my favorite Legends/Expanded Universe characters, Jaina Solo, started flying them. The completed size of this one is 5” x 4.3” x 2.8” so it’s not exactly space-worthy or climb-in-able, but it’s a fun piece to have on display at home. 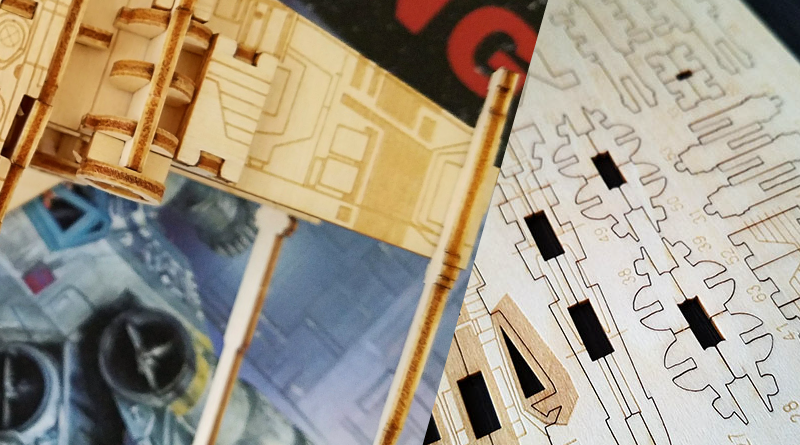 The IncrediBuilds: Star Wars: X-Wing Deluxe Book and Model Set comes with 73 laser-cut wood pieces, a step-by-step instructional booklet, and a hardcover 32-page book all about one of the alliance’s most versatile ships. 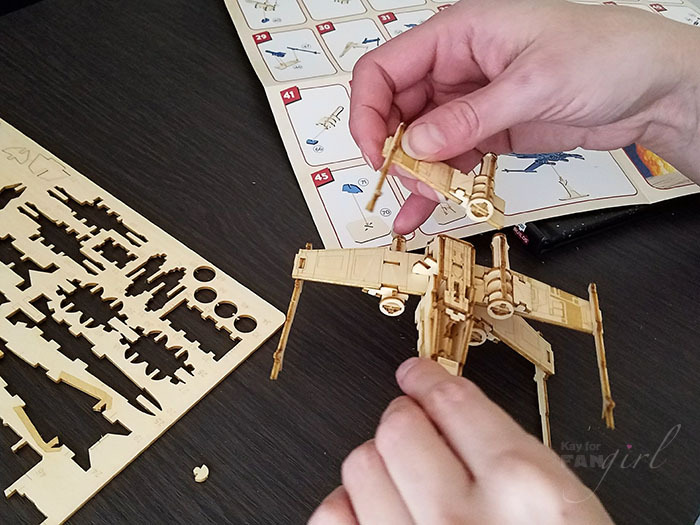 While the IncrediBuilds sets are available in 4 skill levels (easy, intermediate, advanced, and expert), I jumped in the semi-deep end because the X-wing model is listed as an advanced kit. I’d say that’s rather accurate. Knowing the parts on an X-wing ahead of time definitely helped me move faster through the build, which ultimately took about an hour. The assembly instructions are pictorial and thankfully I had only one instance of “Wait. How is this supposed to go in?”. It’s actually a nice way to work your brain a little differently. This particular kit is recommended for ages 12 and up. The instructions also recommend adult supervision. Both are very reasonable considering all the small parts, the attention to detail required, and the extra bit of force you may have to apply to a few of the pieces to get them to go together. 1. Definitely follow the rule of only removing parts out of the larger piece of wood they come in when you’re ready to use that particular piece. The numbers for each are next to them and it’d be very easy to lose track of which one is which and make the process take a lot longer if you knock them out too early. 2. If pieces fall out of their slots before you’re ready to use them (like a few of mine did), keep them as close to the original openings as possible. 3. The pieces are supposed to be easy to pop out. If you have any difficulty, fingernails can help with this task. 4. The wood has a bit of give to it and can withstand some light pressure. Sometimes if pieces aren’t locking together during assembly, you can push them down together on a flat stable surface. 5. Pay attention to shapes and textures. Overall I enjoyed building this X-wing and the final result has great details and dimensionality. No glue is required to keep the model together. I might add a drop to my droid later since mine tends to slide out of its slot if I move the ship. It’s nice though that you can put this together with just what’s included in the kit. The included book has the supply list and instructions for two possible ways to paint your T-65 model if you decide to go that route, but for now I’m leaving mine minimalist and au natural – at least until I decide what color scheme I want. 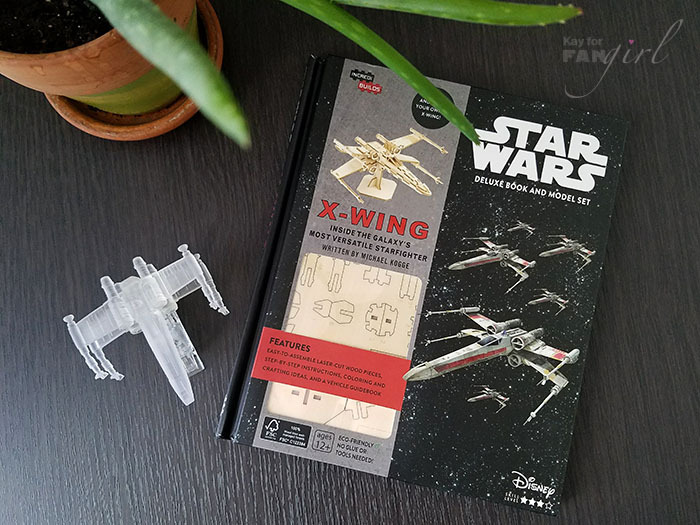 Speaking of the book, it’s called Star Wars X-Wing: Inside the Galaxy’s Most Versatile Starfighter and it’s author Michael Kogge is no stranger to Star Wars books. The content is a great balance of in-universe and our universe info. Not only that, it bridges the ship’s use in the original and sequel trilogy. Stats on both the T-65 and T-70 models almost made me feel like I was getting ready to buy one. 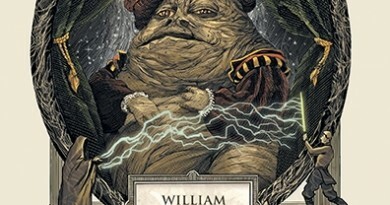 And the behind-the-scenes development and filming details are more in-depth than you’d expect for a book this short – that is until you remember this is Insight Editions and this is their jam. Thanks again to Insight Editions for sending this over for my review. Check out their website to find out what other models are available, get a X-wing kit of your own, or discover where else IncrediBuilds are sold. As usual do not repost any of this content without permission from the author/photographer.